The UK’s Information Commissioner’s Office published new guidance for website owners regarding cookie user and online privacy. As the UK moves towards compliance, they are already half way through the year that the ICO gave businesses to get their digital house in order, the prevailing attitude is that businesses ‘must try harder’. “unlikely to prioritise” – looks like the door is not completely shut on using Google Analytics then – I am cautiously positive. It remains to be seen what other European countries do. While we wait, in Sweden, for the PTS to produce guidelines we should make sure our own houses are in order, identify the cookies we use and give users clear instructions on why we’re using them – hasty implementations of consent boxes and banners may not necessarily be the best solution in the long term. The IAB in Sweden (the trade association for the digital and interactive marketing industry) have, this month, released a set of new recommendations on how website cookies should be used. These place the emphasis on the website visitor’s browser setting to determine whether cookie will be used, and move away from the website banners that have been previously promoted as a solution. These recommendations are a response to the Electronic Communications Act (Sweden), which is itself a response to the EU directive concerning on-line privacy. This directive requires consent from a website visitor before cookies are placed on their computer; but – as I’ve posted previously – this breaks many important tools for ensuring a good visitor experience. Not least, it directly impacts the use of Google Analytics. They promote the use of a standardised badge, to help users find out what cookies are used and make their own choice. I need cookies to do my job – that is, to make the user experience better; these recommendations seem like a sensible solution for everyone. Unfortunately, I doubt that the EU will entirely agree – particularly given the apparent disagreement between EU ministers on how this directive should be enforced. (You can see this slow car crash unfolding by checking out all my posts on the cookie directive). What do you think? Will this work – is this an alternative to the opt-in banners which seem to be popping up? IAB recommendations in Swedish and English. The Swedish Government has introduced a banner on their website asking visitors to explicitly accept having cookies placed on their website (click on the image to make it larger). It sure ain’t pretty, and will probably have the same catastrophic effect on the Google Analytics data they collect that the ICO, in the UK, experienced when they introduced something similar. Will the last analyst left in the building please turn the lights off when they leave…. Confusing and bad news for website owners – EU Data Supervisor says that industry guidelines for cookie use are not sufficient and that consent for cookie use must be actively obtained – criticizing the softer stance of EU Commissioner. Rather than have the usual picture of biscuits, jars or muppets to go with this cookie post I thought I'd channel some Johnny Cash instead. Image: Flickr - Diogo A Figueira. This is another of my posts about the EU directive which threatens life as we know it. This is an amendment to the EU’s Privacy and Electronic Communications Directive which forces website owners to obtain consent from a website visitor before cookies can be left on their computer. The upshot of this would be a sudden, and profound, hole in the data we collect on customer behavior on our websites. No one really knows what the hell to do – since the Directive’s amendment, confusion has reigned supreme with some EU countries not getting round to implementing it while others, like the UK, bashing out a rapid response – and then giving organisations a year to respond to it. Websites which have attempted to get visitor consent have screwed their site, and their data collection, with unwieldy solutions – the UK Information Commission’s Office, I’m looking at you. Right now, there has not been any major indications that cookie use is being reduced. EU Data Protection Supervisor criticizes EU Commissioner – Advertising Association guidelines unworkable? Neelie Kroes, the EU Commissioner behind this directive, had previously said that European companies have a year to comply with the directive and that she supported efforts by advertising associations (such as the IAB) to create some kind of standardized opt-in. Not good enough, responded Peter Hustinex the European Data Protection Supervisor. In a recent speech he specifically said that the guidelines suggested by the IAB fell short of the requirements of the directive, despite them being welcomed by Kroes, the EU Commissioner. He went on to say that Kroes’ support for a US ‘do not track initiative’ also fell short of the Directive’s requirements. One measure he suggested was a default browser setting of non-acceptance for cookies. More confusion – even the EU can’t seem to agree on what this directive means. Germany and Denmark have aready got a ban on using Google Analytics (from earlier concerns about IP addresses), but many companies in those countries continue to use it, knowing that the risk of being penalized is relatively low. 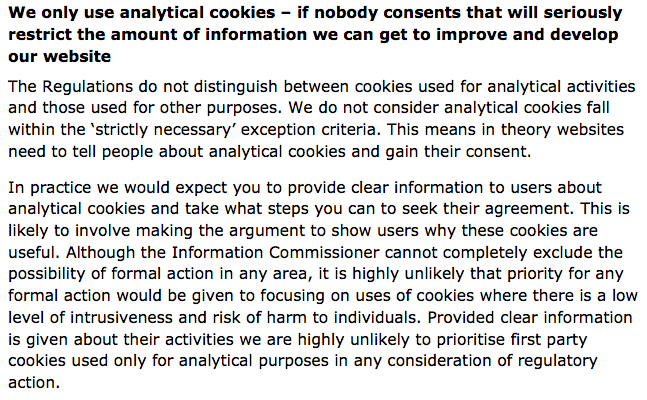 However, for those of us operating in the public sector there’s a risk that we could get some form of all-encompassing edict of ‘no cookie use without consent’ and boom, there goes our main method for collecting data for improving our websites. Sigh. Where do we go from here? I really don’t want to be saying ‘I told you so’ in a few years time. Cookie Law Comes Into Effect In Sweden – PTS are reponsible and no detail available yet. The new cookie law came into effect, in Sweden, on the 1st of July. It’s a response to the horrendous EU directive, widely seen as a cookie killer, which is an attempt to address online privacy issues. I’ve previously blogged about it here. The short version is that the directive requires consent from a website visitor, before a cookie can be placed on their computer. This impacts a whole bunch of website functionality, but not least Google Analytics. Brian Clifton has blogged about the implications for Google Analytics in two blog posts, shortly after the launch of the directive in the UK and then a little later. If you’re in Sweden, then there’s a couple of things worth knowing. First, the Swedish Post and Telecom Agency (PTS) is responsible for the execution of this new directive, and its Swedish interpretation. When I posted this, they had some information for website owners, but nothing concrete. There’s certainly not a ‘cookies are the big bad’ message from them – so far, so good I say. Right now, they are saying that they are giving website owners time to figure out how to get consent for cookies from website visitors. The other important thing to know is that the Swedish arm of the IAB has prepared guidelines for website owners and are looking for feedback. The guidelines are available in both English and Swedish. Their suggestion is that consent is based on the users browser settings. The IAB guidelines are a best practice suggestion which avoid killing our website functionality with ugly consent requests (check out the banner on the top of the ICO’s website from the UK – and then take a look at what this has done to the data they’ve been able to collect from Google Analytics). Best thing you can do right now? Don’t panic, read Brian’s latest blog post and get your website’s privacy statement in order. Checking to see what cookies your website is leaving on people’s computers might not be a bad idea either.